The elder Dagar brothers Usatd Nasir Moinuddin Dagar (1919-1966) and Ustad Nasir Aminuddin Dagar (1923-) were recognised as the foremost singers of the Dagar tradition of their generation. They were trained in the musical tradition of their family by their father Ustad Nasiruddin Khan (1889-1936), and their uncle Ustad Ziauddin Khan (1886-1946) and Ustad Riyazuddin Khan (1885-1947). In their juggalbandi (duet) singing, they complimented each other with their slightly contrasting styles and deferring voice qualities and shared a rapport that is possible only between musicians who have undergone their entire process of musical development together. Their singing was characterised by serene and dignified alap, a richness of subtle microtonal ornamentation, and the beauty and imaginativeness of the melodic elaboration. The elder brother Ustad Nasir Moinuddin Dagar, who usually dominated the proceedings, was particularly known for his mastery over the deeper and subtler aspects of the Dagar tradition. His singing had all the characteristics of the nada, sadhana of the Dagar gharana and his music contained stylistic influences of his father Ustad Nasiruddin Khan and his uncle Ustad Ziauddin Khan. In many of his performances he would actually demonstrate the stylistic peculiarities of his great predecessors. There was dynamism, a certain element of surprise in the sudden turns that his melodic improvisation could take. The younger brother Ustad Nasir Aminuddin Dagar with his slightly restrained style, a deep resonant voice and flowing patterns full of devotional feeling form the perfect juggalbandi (duet) partner for his elder brother. 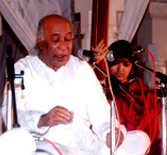 After the death of Ustad Nasir Moinuddin Dagar, Ustad Nasir Faiyazuddin Dagar continued the tradition of Dhrupad juggalbandi singing. A musical tradition, which depends on a very small number of musicians for its survival, with just one or two of them having a grasp of the tradition in its totality, always runs the risk of suffering decline due to the loss of a crucial member. The untimely deaths of outstanding musicians like Ustad Nasiruddin Khan, Ustad Ziauddin Khan, Ustad Hussainuddin Dagar (Tansen Pandey), Ustad Nasir Moinuddin Dagar and others has deprived the Dagar tradition of such crucial torchbearers. Yet a core body of knowledge still survives, and it is to be hoped that this knowledge will be built upon and the tradition will rejuvenate itself.